The field of single-cell genomic and proteomic analysis is positioned to transform many areas of life sciences and medicine. This field is experiencing significant growth because of the emergence of new tools for analyzing DNA, RNA, and proteins at the single-cell level. At the same time, there is a growing awareness that genomic and/or proteomic variations among apparently identical cells can have a significant impact on human health and disease. Traditionally the single-cell analysis workflow required extensive labor and low throughput. However, new instruments, reagents, and workflow strategies have simplified and automated the isolation, sample preparation, and analysis of single cells. This has resulted in significant market opportunity for companies who are presently in this business or seeking to participate in the future. Single-cell analysis is important in a range of applications in which cell sub-populations may play an important role in a heterogeneous population of cells. In these cases, it is useful to identify and analyze rare individual cells within a heterogeneous population and profile them. Another reason to use single-cell analysis is to investigate organisms that cannot be cultured easily, such as noninvasive in the human body. In these cases, it is not possible to analyze using standard techniques because the organisms cannot be cultured or because they exist within heterogeneous microorganism populations. Conventional omics, particularly genomics, need large numbers of cells (millions of cells), and so have not been well suited to SSA (single strand annealing). Thus, the key objective is to modify conventional omics so that they can be used on single cells. Therefore, single-cell platforms consist of ultrasensitive tools for clarifying specific molecular pathways and give insights into the nature of cell heterogeneity. In the clinic, single-cell analysis is important where there is a very low quantity or only a single cell is available for analysis -- as is the case with preimplantation diagnostics and liquid biopsy for cancer applications. According to BCC Research's Single-Cell Genomics and Proteomics: Emerging Technologies and Markets (BIO143A), global single-cell analysis market is estimated to be worth $626.2 million in 2015 and is expected to grow at a compound annual growth rate of 20.7% to reach $1.6 billion in 2020. 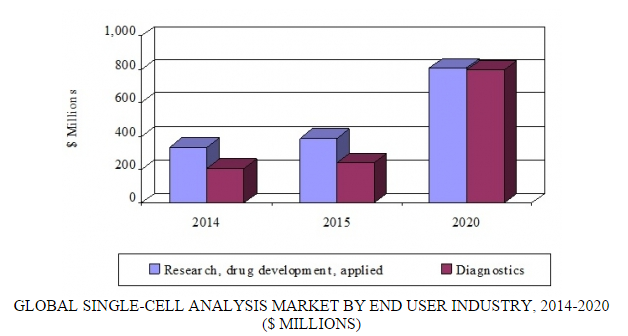 The market size for single-cell analysis products among research, drug development, and applied end users is $386.1 million in 2015 and is growing at a compound annual growth rate of 15.9% to reach a forecast market size of $808.5 million in 2020. Single-cell analysis tools are penetrating these market segments at a high rate due to both improvements in workflow integration and automation, and to the ability to analyze heterogeneous cell populations in fields as diverse as immunology, neurology, stem cell biology, oncology, and basic cell biology. The diagnostics market segment is expected to reach $240.1 million in 2015 and is growing at a tremendous 27.1% CAGR. Consequently, this market is projected to grow to $796.8 million in 2020. Cancer applications dominate this market, with the need to understand and characterize single cells within heterogeneous tumors helping to drive adoption. In particular, the liquid biopsy market segment is growing at a fast rate, driven by the need for noninvasive and repeated testing over the course of therapy or for monitoring to help guide oncologists. The single-cell industry is composed of multiple subsectors, reflecting the unique aspects of the workflow, from cell isolation to sample preparation and genomic and/or proteomic analysis. Acquisitions and strategic alliances within the industry are common, often driven by a need to improve or integrate parts of a single-cell workflow or to access new markets or customers. "The future for single-cell analysis is bright, as it is an enabling technology to the life sciences industry and provides unique insights into biological systems," says BCC Research analyst John Bergin. "The single-cell analysis market is still in its early stages of growth and penetration into multiple market segments, providing excellent opportunities for companies to offer innovative solutions."